Beatles on Ed Sullivan 50th anniversary: Why the performances were important. What was so important about the Beatles’ appearances on The Ed Sullivan Show? 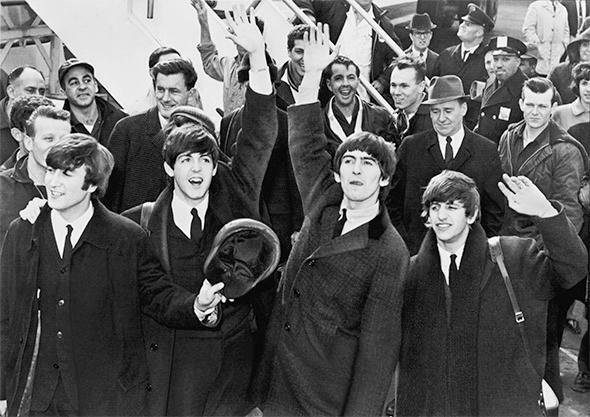 The Beatles wave to fans after arriving at Kennedy Airport on Feb. 7, 1964. This Sunday marks the 50th anniversary of the Beatles’ first appearance on The Ed Sullivan Show. In 2004, on the 40th anniversary of the performance, Fred Kaplan explained the significance the event held for the teenagers of the 1960s. His article is reprinted below. It may be impossible for anyone who wasn’t living at the time to grasp how much the country changed 40 years ago this Sunday. On Feb. 9, 1964, at 8 p.m. ET, the Beatles appeared on The Ed Sullivan Show. Everyone knows the rough outlines: the Fab Four mop-heads from Liverpool, their journey to America, thousands of teenagers screaming in the streets, the subsequent “British invasion,” and the transformation of rock ‘n’ roll. But Americans under, say, 40 have had to take the historic importance of these events on faith. Listening many years after the fact to those early Beatles songs (“I Wanna Hold Your Hand,” “She Loves You,” “Please Please Me,” and so forth), they must have wondered—must still wonder—what the fuss was about. These are fairly sappy tunes, compared with what followed, from not only the Beatles but other bands. A 2003 DVD clears up the generational mystery. The two-disc set is called The Four Complete Historic Ed Sullivan Shows Featuring the Beatles, an inelegant but meticulous title. It contains all four Sullivan shows on which the Beatles made live appearances—the three Sundays in a row in February ’64 (Feb. 9, 16, and 23) and their return on Sept. 12, 1965—not just the parts with the Beatles but each hour-long program in its entirety, commercials included. Not only is it a fascinating time capsule (and a teary piece of nostalgia for those of us who well remember the broadcasts from our youth), it also provides an unvarnished picture of the popular culture of the era—and, thus, the impact that the Beatles had on it. To a degree that young Americans couldn’t comprehend today, The Ed Sullivan Show was American popular culture. More than 50 million Americans—over half of the TV-viewing audience at the time—tuned in to it on CBS every Sunday night. (More than 70 million watched on the night of the Beatles’ debut.) It was a variety show like no other, with animals, acrobats, puppets, plate-twirlers, stand-up comics, nightclub singers, scenes from the latest hit musicals and ballets—all the acts personally selected by this odd-looking, odd-talking, otherwise untalented ex-gossip columnist. Ed Sullivan was a one-man cable television system with wrestling, BRAVO and comedy channels, Broadway, Hollywood and C-SPAN, sports and music video. We turned to him once a week in our living rooms for everything we now expect from an entire industry every minute of our semi-conscious lives. Everybody liked this stuff back then. I remember liking it, too. That’s all there was. There was no concept of an alternative. A slew of clueless scholars and columnists have mused, over the decades, that the Beatles caused such a sensation because they snapped us out of the gloom brought on by the Kennedy assassination, which had taken place the previous November. This is silly sociology. Look at these DVDs or at any footage of a Beatles concert or a Beatles mob. It’s extremely doubtful that any of these teenage girls were cheering, screaming, palpitating, even crying with joy as some sort of catharsis to their anguish over Lee Harvey Oswald’s deed in Dallas. Meanwhile, their parents, who were the ones more likely traumatized by the death of the president, remained tellingly immune to Beatlemania. The Beatles took hold of our country and shook it to a different place because they were young, because their music had a young, fresh feel, and because—this is the crucial thing—our parents didn’t get it. Ed Sullivan didn’t entirely get it, either—and why should he have? He was even older than our parents. Legend has it that, on a trip to England a few months earlier, Ed saw the commotion the Beatles were causing and thought he’d book the lads on his show as a novelty act—until their manager, Brian Epstein, insisted on top billing. You can imagine Ed thinking: Top billing for these kids? Above Frank Gorshin, Myron Cohen, Gordon and Sheila McRae? Above Hollywood’s delightful Mitzi Gaynor?! The timing of the Beatles was perfect. 1964 marked the emergence of the Baby Boomers as a social force—and the Beatles were the vehicle for their ascendance as a cultural force. What records were the No. 1 hits on the pop charts before the Beatles took over the slot and stayed there for years to come? Bobby Vinton’s “There! I’ve Said It Again,” the Singing Nun’s “Dominique,” and Dale & Grace’s “I’m Leaving It Up to You.” The Beatles changed the charts forever. You can draw a line in the historical sands of popular culture at 1964. A lot of pop music that came after that point still sounds modern today. Almost all the pop music that came before that point sounds ancient. Read more of Slate’s coverage of the Beatles at 50 from Blogging the Beatles.